I admit it seems crazy to suggest this Thai-style peanut brittle1 as a snack alternative as part of this year’s Thai New Year celebration which is currently going on. But if the idea of snacking like a goddess — just for this year anyway — tickles your fancy, you can find out how to make this treat and a little bit of Songkran history in my most recent CNNGo article: Goddesses and peanut brittle: This year, celebrate Songkran in supernatural style. 1 Thai-style peanut brittle often, though not always, contains sesame seeds. It’s also not as hard as western-style brittle is, and it is much, much less candy-like. 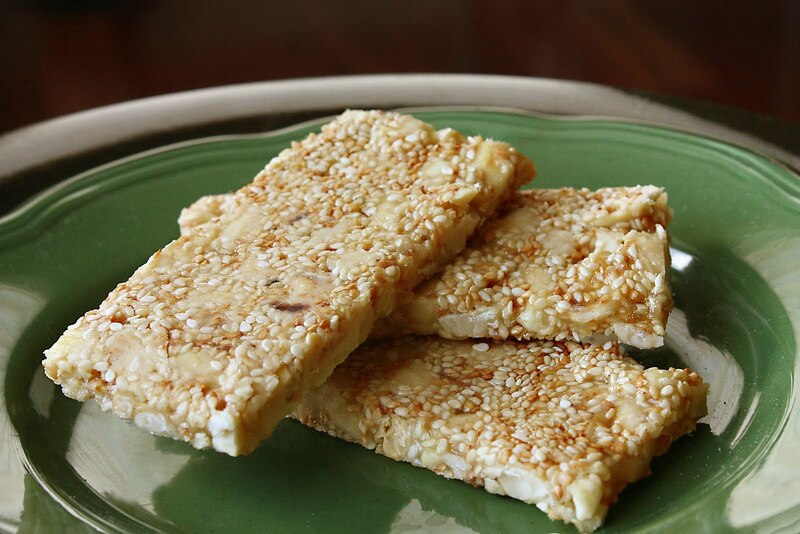 When the brittle is made entirely out of sesame seeds, similar to Greek pasteli (παστέλι), it’s call Nga Tat (งาตัด). It’s not nearly as common as peanut, or peanut-sesame, brittle, though.